[130 Pages Report] The parking management market size was USD 3.03 Billion in 2017 and is expected to reach USD 5.15 Billion by 2023, growing at a Compound Annual Growth Rate (CAGR) of 8.7% during the forecast period. The base year considered for the study is 2017 and the forecast period is 2018–2023. The research methodology used to estimate and forecast the parking management market began with capturing of the data on the key vendor revenues. The market size of the individual segments was determined through various secondary sources including industry associations, white papers, and journals. The vendor offerings were also taken into consideration to determine the market segmentations. The bottom-up approach was employed to arrive at the overall size of the parking management market, by considering the parking management adoption rate in parkings in use and parking management pricing of key players, which were then verified through primary research by conducting extensive interviews with key industry personnel, such as Vice Presidents (VPs), directors, and executives. The data triangulation and market breakdown procedures were employed to complete the overall market engineering process and arrive at the exact statistics for all the segments and subsegments. 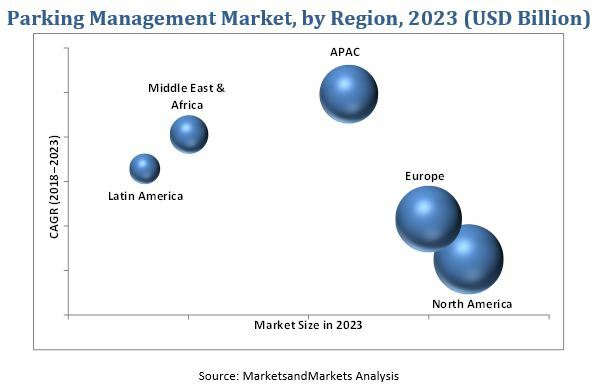 The parking management market ecosystem includes major players, such as Conduent (US), Amano Corporation (Japan), Q-Free ASA (Norway), Indigo Park Services (UK), Chetu (US), Streetline (US), SWARCO (Austria), T2 Systems (US), SKIDATA (Austria), Flowbird Group (France), INRIX (US), Flashparking (US), Parkmobile (US), Passport (US), SpotHero (US), TIBA Parking Systems (US), Urbiotica (Spain), Smart Parking (Australia), SAP (Germany), Siemens (Germany), APCOA (US), Bosch Mobility Solutions (Germany), GET MY PARKING (India), Nester (UAE), and NuPark (US). The parking management market takes into account several technology segments, deployment types, solutions, services, and parking sites to arrive at the global market size for parking management during the forecast period. The parking management market size is expected to grow from USD 3.39 Billion in 2018 to USD 5.15 Billion by 2023, at a Compound Annual Growth Rate (CAGR) of 8.7% during the forecast period. The major driver for the market is expected to be the growing focus on seamless traffic flow and reduction in fuel consumption and increasing motor vehicle sales. The major restraining factor for the growth of the market could be the complexity in system integration.The scope of the report covers the market analysis by type (solutions and services), deployment type, parking site, and region. The parking access and revenue control solution is expected to account for the largest market share during the forecast period. This solution helps parking operators to manage in and out of vehicles in parking facilities and also empower them to take full control over the parking revenue. The parking guidance solution is expected to grow at the highest CAGR during the forecast period because of rapid deployment of the solution by city authorities. The solution helps save time and fuel by showing the real-time parking availability to drivers. The professional services segment is expected to hold a larger market size during the forecast period, owing to the growing need for parking management consulting for designing and deployment of solutions, and continuous support and maintenance activities for continuous and seamless working of parking management market solutions. Professional services include planning, designing, consulting services, support services, IT maintenance, repairs, and upgrades. The cloud deployment type is expected to reord a higher growth rate during the forecast period. The cloud-based solutions are cost effective and easily scalable as per business requirements. These advantages encourage companies to adopt cloud-based parking management solutions. Cloud-based solutions facilitate organizations with scalability and the ease of accessibility of organizational content, regardless of employees’ location, thereby helping with business continuity. Cloud-based solutions are widely adopted in the developing countries. The off-street parking is expected to hold a larger market size during the forecast period, owing to huge investments made by authorities in multi-level parking, and by the private sector in its parking facilities. The off-street parking involves proper designing and construction to provide a safe and secure vehicle parking experience for drivers. Moreover, it focuses on ensuring security, pre-booking of parking spots, and parking fee management. All the modern public infrastructure are coming with advanced off-street parking facilities. The major vendors profiled in the parking management market report include Conduent (US), Amano Corporation (Japan), Q-Free ASA (Norway), Indigo Park Services (UK), Chetu (US), Streetline (US), SWARCO (Austria), T2 Systems (US), SKIDATA (Austria), Flowbird Group (France), INRIX (US), Flashparking (US), Parkmobile (US), Passport (US), SpotHero (US), TIBA Parking Systems (US), Urbiotica (Spain), Smart Parking (Australia), SAP (Germany), Siemens (Germany), APCOA (US), Bosch Mobility Solutions (Germany), GET MY PARKING (India), Nester (UAE), and NuPark (US).